A feature coffee table is the centrepiece of any living room. There are a huge variety that range from metal and glass, to solid wood, illuminated and storage ottoman coffee tables. Here is our pick of what will be on trend in 2019. The Ocean Intrigue Multi Coffee Table is made from reclaimed scaffolding and railway sleepers, features 3 individual tables that can be used together or separately. The Blake is a beautiful contemporary ottoman coffee table with a gold coloured stainless steel frame and plump navy velvet ottoman top. 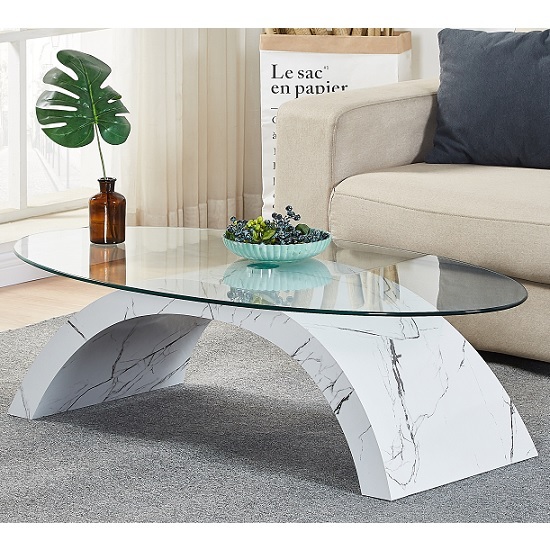 The highly popular Grayson Coffee Table fuses a minimalist design with solid materials that give you a two tiered coffee table that will bit effortlessly into any living room. The coffee table is available in both ash and walnut finishes. The Colby is a contemporary rectangular coffee table that features a sturdy frame and 2 tempered glass shelves. The transparent shelves makes the Colby a great solution for the smaller living room. The Cheadle is a solid oak coffee table features 4 pullout drawers so you can store your remotes, magazines, coasters and more away from sight. The coffee table also features a lower shelf for larger items. The slightly tapered legs gives the Cheadle a gentle look. A superb coffee table that has ll the features you need. The Radial Round is a unique fair trade coffee table that features a parquet style round table top and lower shelf. The coffee table is made from mango wood encased in an iron frame. Absolute Home works with over 100 top UK and international brands to bring you a fantastic range of the latest coffee tables. You can view even more from our latest listings here.